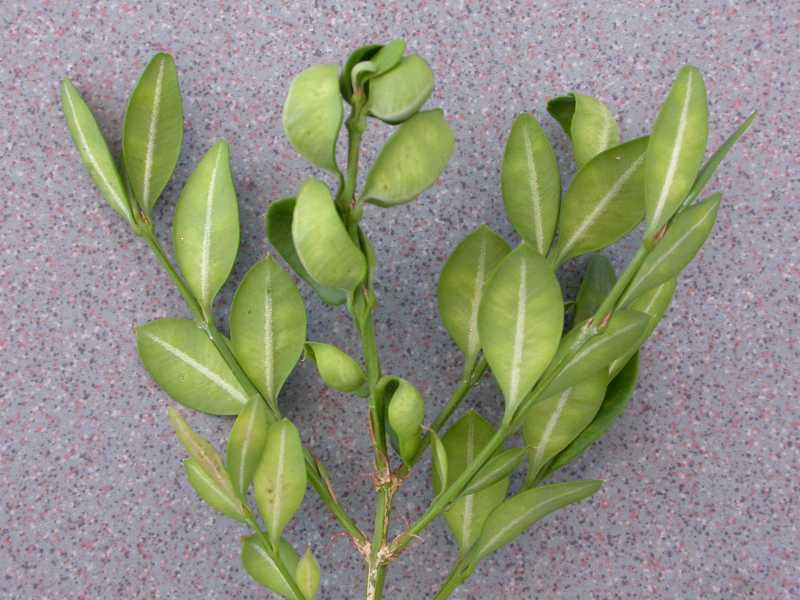 This pest is the most serious pest of this evergreen plant. It occurs everywhere in the USA from the East to the West coast. All varieties of boxwood are susceptible but the slower-growing English varieties are less susceptible than the American cultivars. 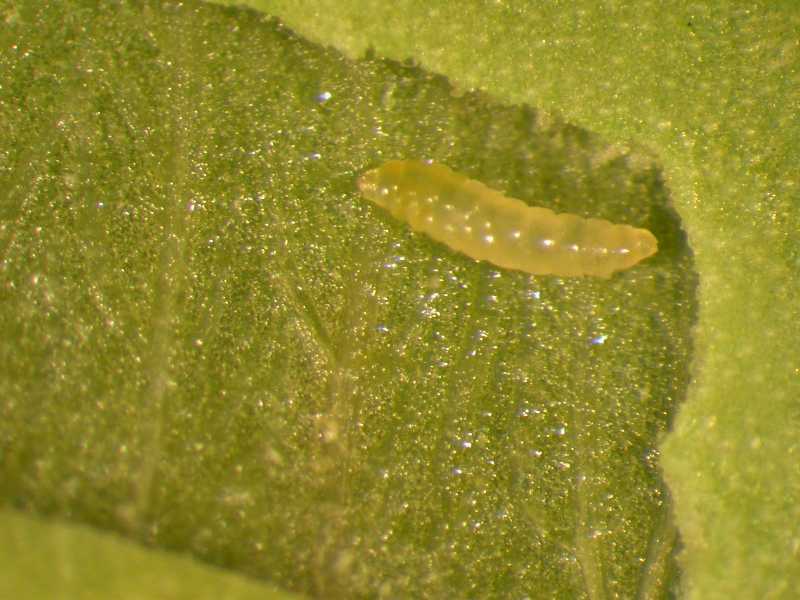 The leafminer feeds between the upper and lower sides of the leaf. 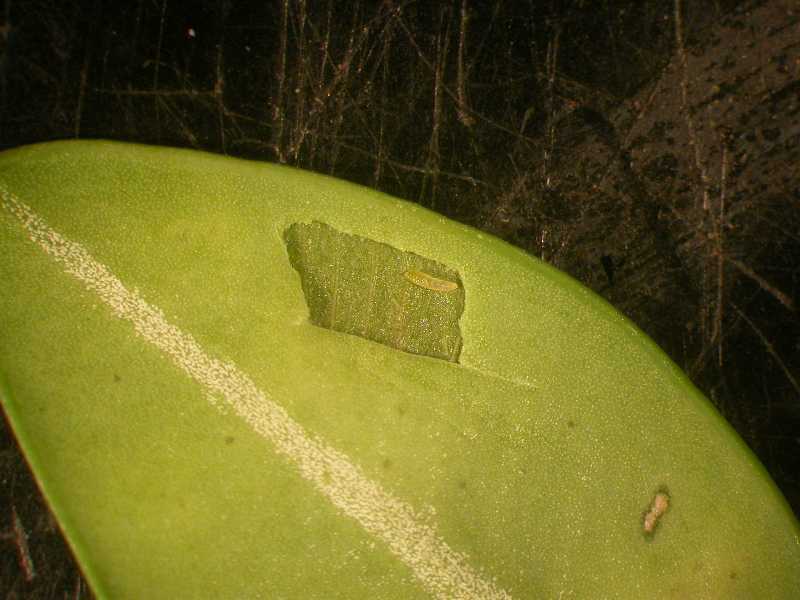 The larvae feeding between the upper and lower parts of the leaf causes blisters on the underside of the leaf. 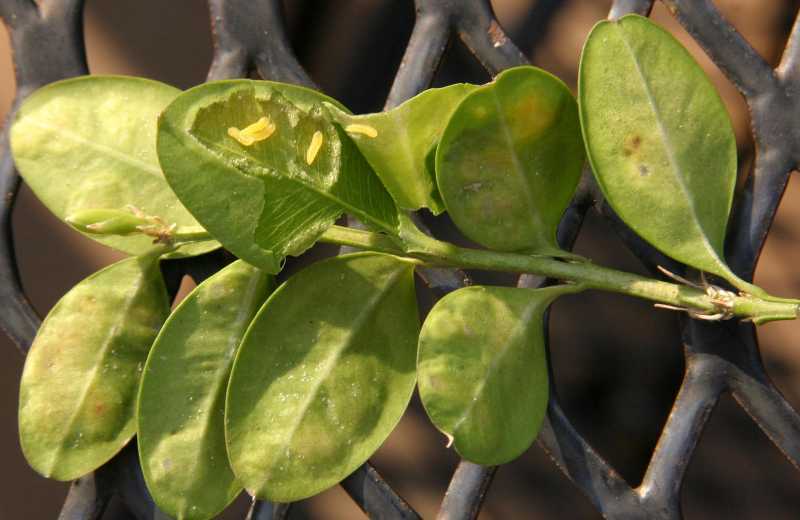 The leaves infested by this pest become yellow and smaller than a normal leaf. When the plant is severely infested, it appears completely unhealthy. 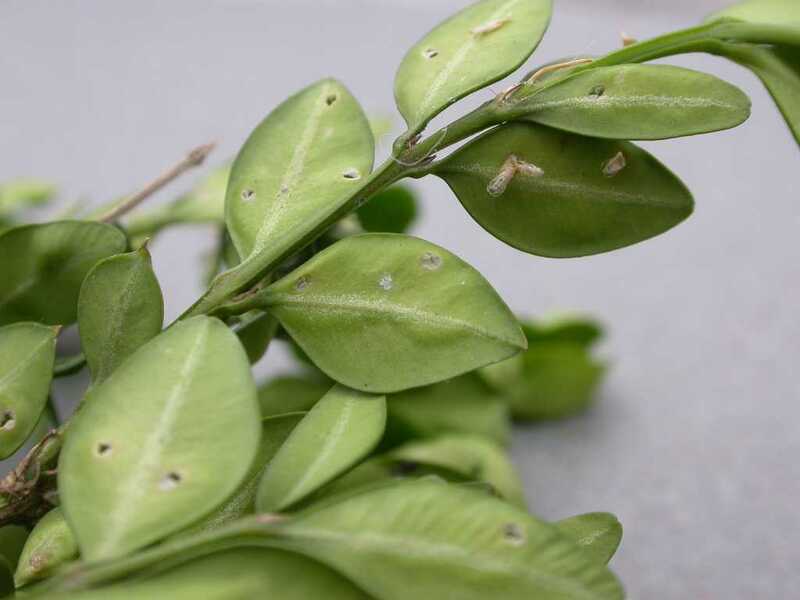 Boxwood leafminers over-winter as partially-grown larvae in the leaf blisters. When the days warm in spring, the larvae become active and grow rapidly feeding between the upper and lower leaves for the balance of the summer. In May the adults force the pupal skin out of the mine, where it hangs for a few days after the fly, a gall midge, emerges. 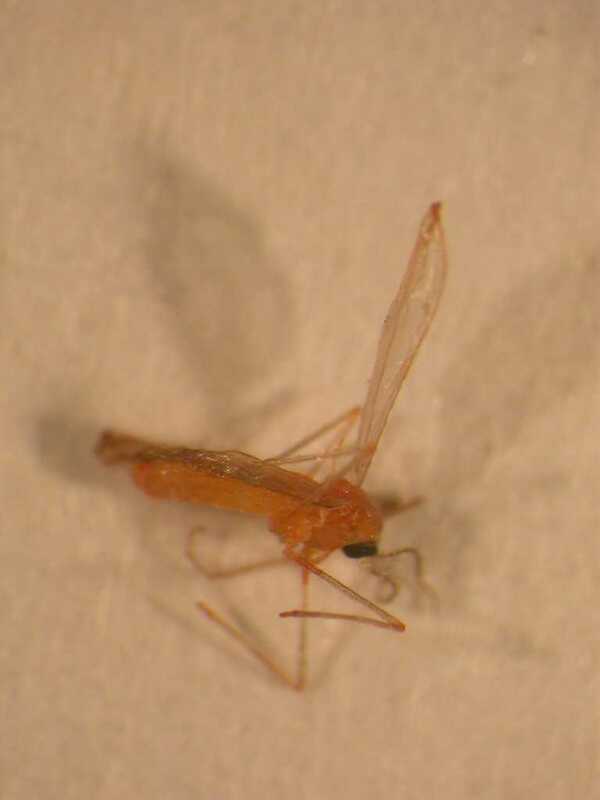 The adult leafminer is a yellow to orange-red fly that looks like a mosquito. 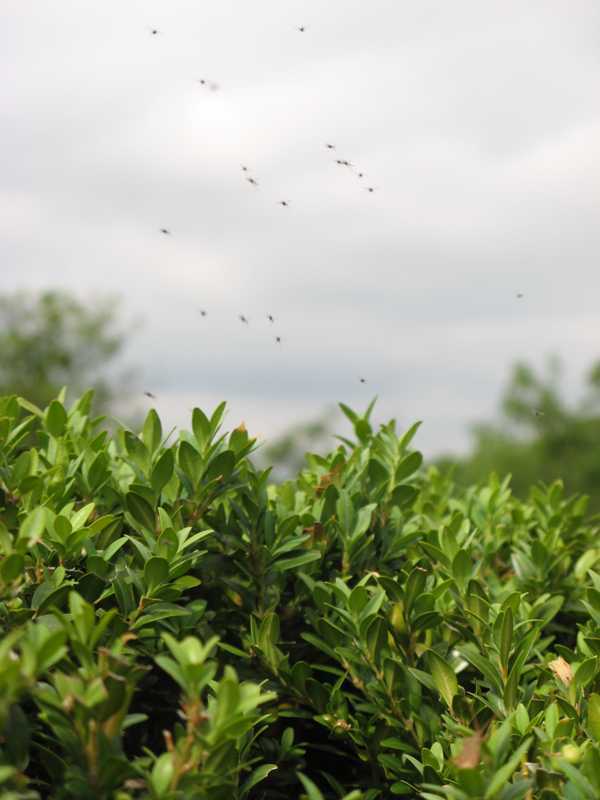 Adult flies swarm around boxwoods about the time that the Weigelas bloom. 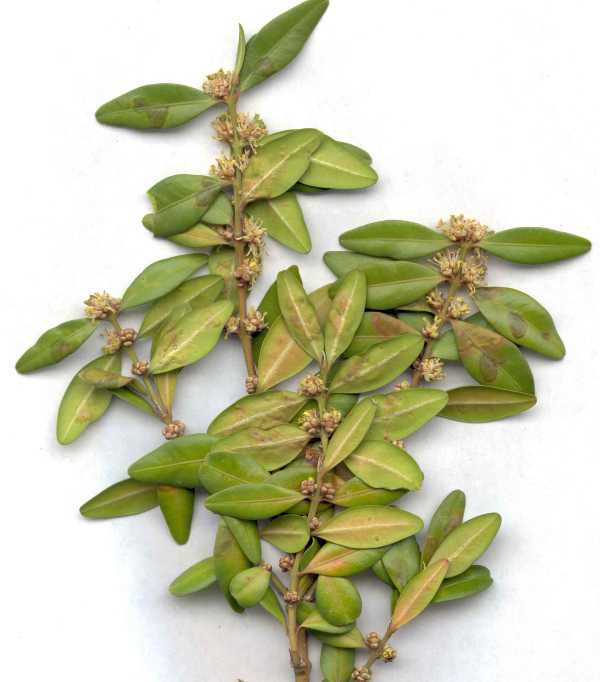 When the boxwood’s new growth appears in spring, the females mate, then insert their eggs into the underside of the leaves. The adult fly dies soon after. 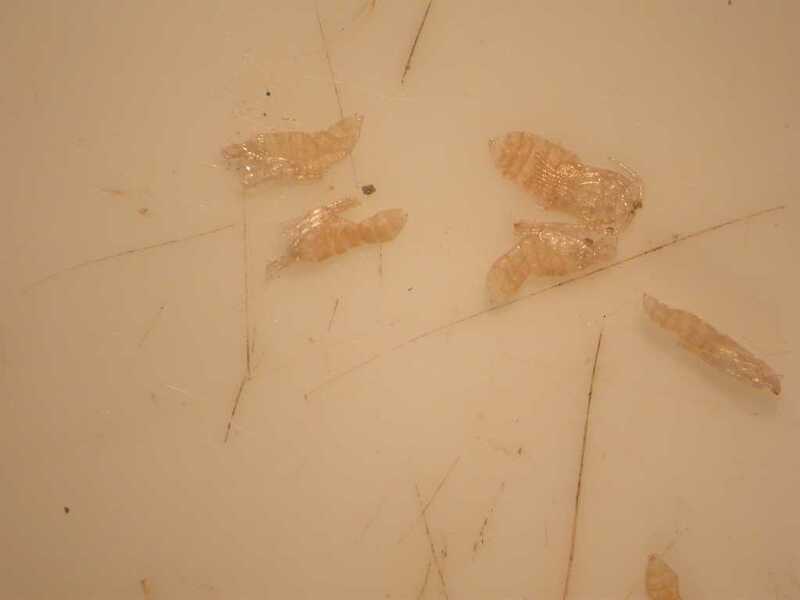 The eggs hatch in about 14-21 days into the larval stage ( a maggot) that grows and feeds for the rest of the summer. 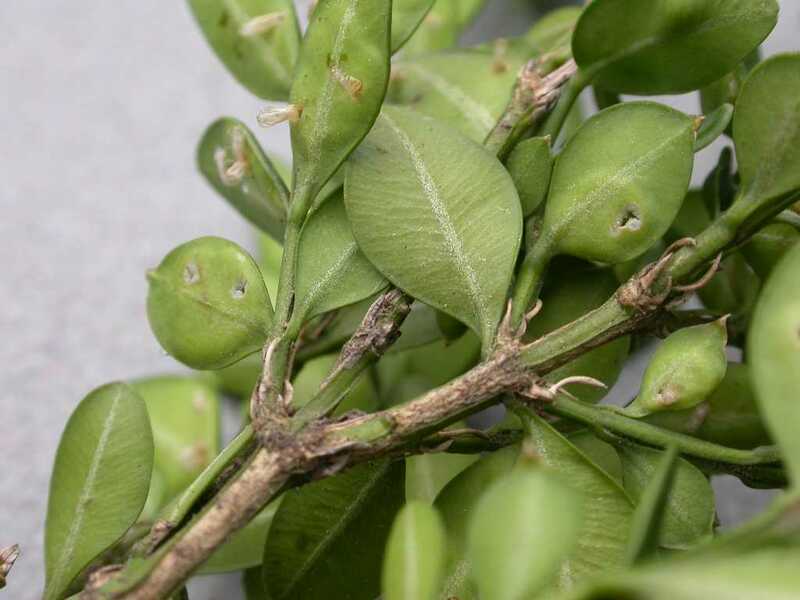 The leaves develop the characteristic blisters as the larvae feed. The larvae then develop into orange pupae which darken before the adults emerge. One generation of the pest occurs each year. 1. Select resistant cultivars. 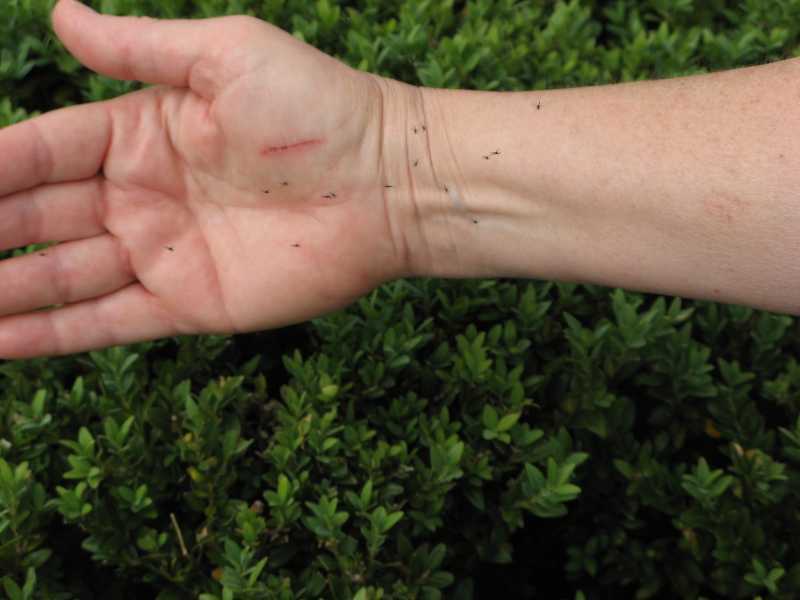 Culltivars of English boxwood such as Buxus sempervirens 'Pendula,' '‘Suffruticosa,' 'Handworthiensis,' 'Pyramidalis,' 'Argenteo-varigata' and 'Varder Valley' are more resistant. 2. Natural controls. Encourage natural predators such as green lacewings and spiders. Maintain plant vigor since healthy plants are more tolerant of insect damage. 3. Mechanical controls. Prune the foliage before adults emerge or right after adult flies lay their eggs in May. This reduces the overall population of the leafminer. Pinch leaves hard enough to kill maggots in the infested leaves when practical. 4. Chemical insecticide control. If you choose to use a pesticide, apply when the new leaves are fully formed, around May 1st when the Weigela is in bloom. Make a second application between mid-June and mid-July. Use carbaryl (Sevin) or malathion to control adult flies. Acephate (Orthene) applied in mid-May (about 3-4 weeks after the adults emerge.) can be applied to control the larvae developing in the new leaves. 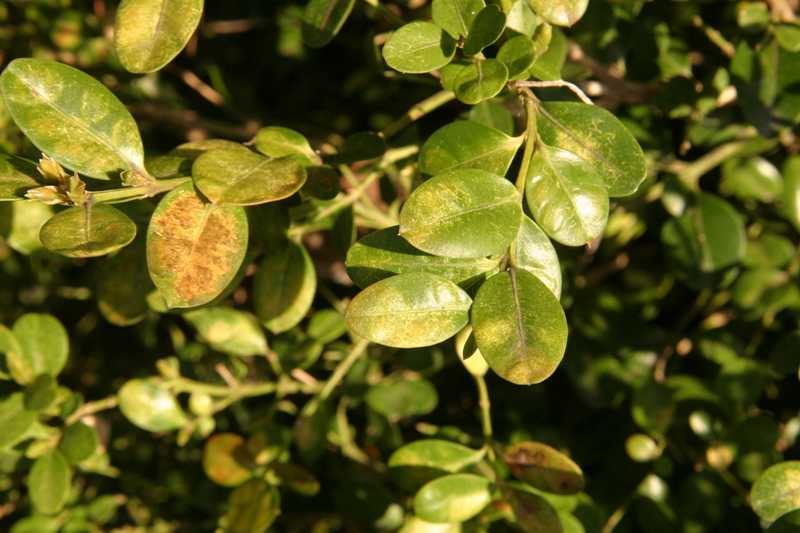 In February to early April, the systemic insecticide imidacloprid (Merit) can be applied around the base of the shrub. Strategies 1, 2, and 3 are strictly organic approaches. 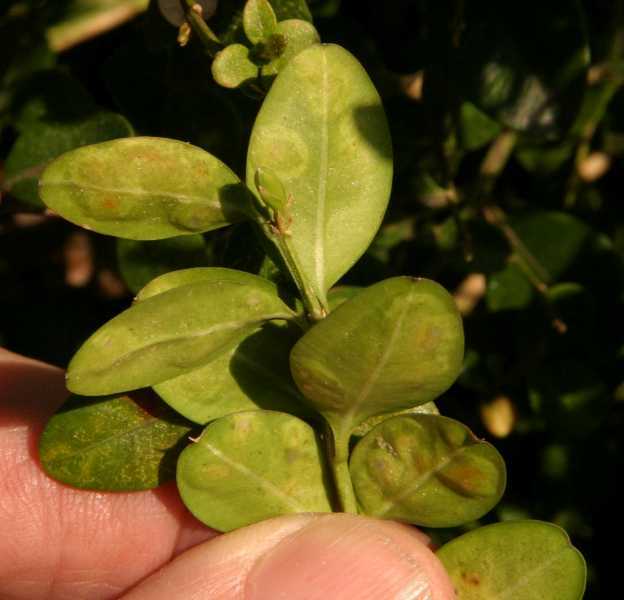 Underside of boxwood leaves (Buxus) shortly after the emergence of boxwood leafminers (Diptera). Note that some of the emergence holes have the pupal cases sticking out. 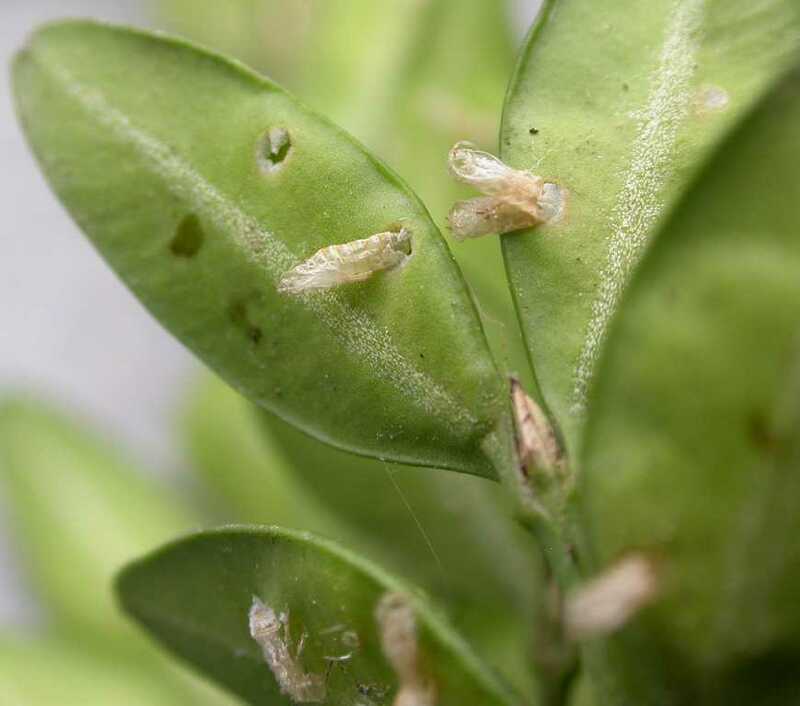 Close-up of pupal cases of boxwood leafminers (Diptera) sticking out of the emergence holes on the underside of boxwood leaves (Buxus). The adult boxwood leafminer is a fly (Diptera) that recently emerged from its pupal case inside a boxwood leaf (Buxus).